Curate Your Consumption: Shoulder your way into the new season! We love a new season at DeviDoll as much as the next fashionista, especially when we spot a trend that we can recreate from our existing wardrobe or a totally new look that has enduring appeal beyond just the one season. That's ethical style at it's best. This Autumn Winter's designer collections first hit the London, Paris and Milan catwalks at the start of the year, so we've had plenty of time to mull over the shows for the most exciting style stories. Right now, we're loving one trend in particular - the statement shoulder. The strong shoulder started as a puzzling oddity a season earlier but is now set to be the signature look of the end of the decade. Pretty much every designer agreed that the shoulder was the It-zone, and each of them had a different take on the trend. At Balmain, where Christophe Decarnin has been experimenting with the trend for long enough to have it down to perfection, everything, from glittery evening dresses to Parisian mariniere and warrior jackets, was adorned with horn-like pads. You can channel the trend with this beautiful organic merino wool Anatomy jacket (left) in a warm shade of brown, pictured left. Amongst surreal clothes at Nina Ricci and Givenchy, the two main trends were definitely prints and statement shoulders, in all forms, shapes and colours. At Hervé Leger, Max Azria dropped the proportions down a notch. The shoulder was still square and futuristic but not so protruding. Jaeger London and Wunderkind had similar creations in graphic colours. Some creations, such as a Jaeger London satin crepe-mix jacket were reminiscent of power dressing circa Working Girl. The 1980s are, after all, the key source of inspiration this season. Dolce & Gabbana made over-proportioned round shoulders the star of their catwalks. The shape has already had some red carpet outings, most notably with Rihanna at the MET Costume Institute Gala. Zac Posen showed slightly smaller shoulders, adorned with grey ruffles. Ruffles also were the inspiration behind this smart organic merino wool stud vest by Kelly B (right). It allows you to work the strong shoulder trend in a work-appropriate way. 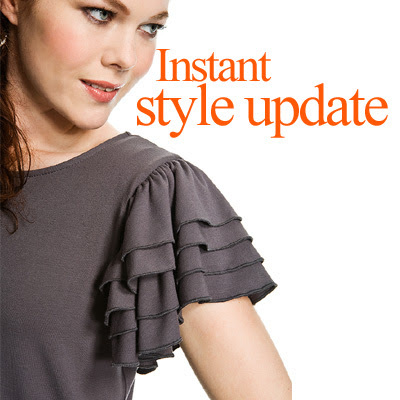 Look out, too, for soft ruffles in the new season's collection from DeviDoll favourite Doie, pictured above. If you want to shoulder you way into the new season now, we'd recommend the organic cotton Melrose dress by Doie (left), available immediately. Its beautifully soft draping shoulders are ultra-feminine. On the catwalks Antonio Berardi, Nicolas Ghesquière at Balenciaga and Isabel Marant had more discreet, softer round shoulders, just as Doie has. The kind of tops which allow you to wear the trend at work, without drawing puzzled looks from more conservative colleagues.